I consider visiting Krakow and then moving to Vienna, Bratislava, Brno, or Prague. 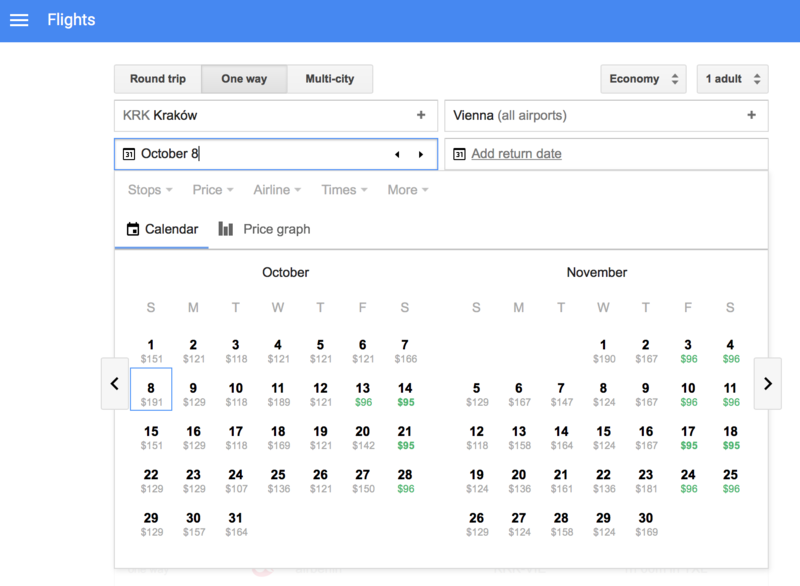 Now, I would like to buy the cheapest train ticket from Krakow. But most European train websites such as GoEuro only show the list of tickets at the exact date, which you must fill in in advance. Is there any such web service? I don't know of any. The French operator SNCF has such a calendar, but it only contains a limited number of mostly domestic routes, plus a few other places to which SNCF runs trains, such as Brussels: https://calendar.voyages-sncf.com/ . Due to the complexity of the European train ticketing systems, this is quite hard to automate. Since you want to depart from Kraków: tickets from Poland to Czechia and Slovakia are especially hard to book over the internet; many can only be bought at a Polish station, although I've read there are agencies that can do it for you. Tickets to Poland can be bought from the Czech Railways site. Some tickets from Poland to Germany can be bought from the DB site. Not the answer you're looking for? Browse other questions tagged trains budget europe online-resources bookings or ask your own question.